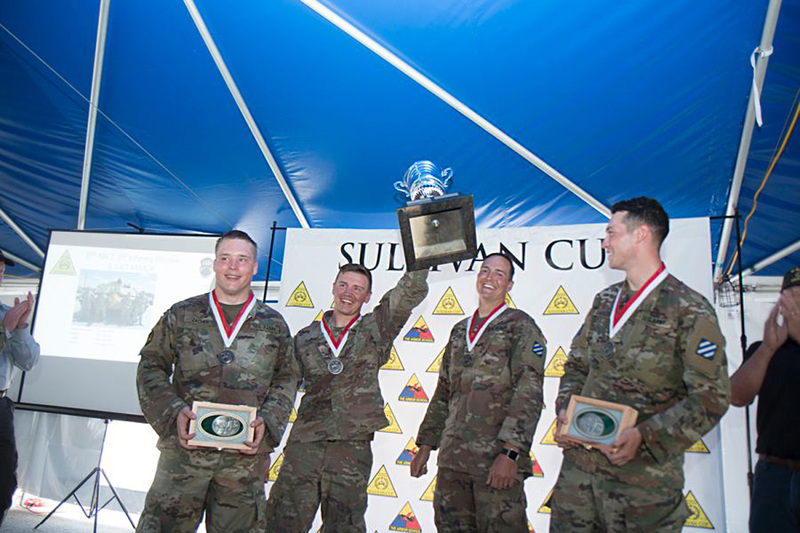 The Sullivan Cup is named for retired Gen. Gordon R. Sullivan, the 32nd Army chief of staff, and the former AUSA president and CEO. The five-day competition allows the best tank crews from across the U.S. Army, U.S. Marine Corps and select international partners from around the world to demonstrate their levels of training and proficiency in tank gunnery and related armor crewman skills. The winning tank crew (Blackwolf 22) that earned the 2018 Sullivan Cup was from B Company, 3rd Battalion, 67th Armored Regiment, 2nd Armored Brigade Combat Team, 3rd Infantry Division from Fort Stewart, Ga.
Each Regular Army division was invited to send one tank crew for every armored brigade combat team in its organization to compete in the Sullivan Cup, for a total of 10 crews. The “OPFOR” (Opposing Forces) from the National Training Center at Fort Irwin, Calif;, were invited to compete, sending their top crew from C Troop, 1st Squadron, 11th Armored Cavalry Regiment. The U.S. Army National Guard supported the competition with a crew from D Company, 1st Squadron, 150th Cavalry Regiment, 30th ABCT, North Carolina Army National Guard. The U.S Marine Corps competed with a tank crew from the 2nd Tank Battalion, 2nd Marine Division. Selected international partners were invited to send two tank crews. Both Australia and Kuwait competed this year, supporting the competition with two international crews. Australia’s crew hailed from B Squadron, 3rd/4th Cavalry Regiment of the Australian School of Armour; and the Kuwaiti crew hailed from the 35th Armor Brigade, Kuwaiti Land Forces. The qualifications published by the Armor School to compete in the Sullivan Cup competition specify only qualified crews of four members who meet the prerequisites for conducting full-caliber live-fire training as specified in Training Circular 3-20.31 may compete. The Armor School guidance further directs participating units to allow only qualified battle-roster tank crews currently holding tank commander, gunner, driver, and loader responsibilities within their respective organizations to compete. This year’s winning tank crew was commanded by Staff Sgt. Johnathan Werner, with gunner Corp. Justin Harris, loader Pvt. Brandon Zacher, and driver Pvt. Dekken Sanders. Making this crew and the tank crew’s parent unit, 3rd Battalion, 67th Armor Regiment, 2nd Armored Brigade Combat Team, unique is the recent transition from an Infantry Brigade Combat Team to become the Army’s 15th ABCT in the last 90 days. “This is stuff that we do on a day-to-day basis; tanker grade gunnery and maneuvering, this is our job,” said Werner. The competition began on Monday, April 30, with 1st Squadron, 16th Cavalry Regiment of the 316th Cavalry Brigade at Fort Benning, doing a live-fire demonstration for the public at Red Cloud Range. The live-fire event showcased combined arms operations with the integration of tanks maneuvering and engaging targets across a simulated battlefield, unmanned aerial vehicles providing surveillance, and mortar and artillery fires engaging targets, all simultaneously. The first day of the competition included a stress shoot adapted specifically for tank crewmen and tank crews with their associated individual and crew served weapons. The timed stress shoot event took each crewmember through an obstacle course and onto a live-fire range. On the range, each crewmember engaged targets with their 9mm pistols, moved to cover behind a tank where they engaged targets with an M4 rifle from the standing, kneeling, and prone firing positions. Transitioning onto the tank, each crewmember engaged targets with the M240 machinegun from the loader’s position and then as a crew, moved a simulated casualty away from the firing line to a safe location where their time stopped. The second event of the first day was held in the Close Combat Tactical Trainer at the Clarke Simulation Center at Harmony Church. Four tank crews at a time were placed in the corners of a virtual battlefield with a mission to move and seize a central objective held by other tanks. Each of these events ended in a “last tank standing” scenario where the final event pitted the winners from each of the previous events against each other to determine an overall winner. The next two days of competition were split between half of the crews on the gunnery range and half completing a series of maneuver STX. Half of the competing tank crews completed six-day and four-night engagements on tank gunnery Table VI, commonly referred to across armor units as a tank crew qualification range. These 10 engagements challenged the crews’ ability to properly test, prepare, and align the fire control system’s sighting and weapon systems for lethality across a broad spectrum of challenging ranges for each subsystem. In addition to the expected 120mm main gun engagements, coaxially mounted 7.62mm machinegun, tank commander’s 50 caliber machinegun and the loader’s 7.62 machinegun, the selected 10 engagements challenged each crew to demonstrate their competency at engaging targets as a three-man crew, firing in a simulated chemical protective posture wearing protective masks, and engaging targets in a degraded posture without power controls, thermal sights and the assistance of a ballistic computer firing solution. All 10 engagements, both day and night, included two or three enemy targets that represent a real-life threat to the tank and crew on today’s battlefield. Incorporating the known capabilities of near peer competitors around the world, the tank crews were challenged with engaging multiple targets simultaneously with multiple weapon systems and ammunition. For tank crews on the move and exposed to an enemy in a defensive position, 10 seconds is not a lot of time to acquire the targets, issue a fire command that coordinates the crew’s efforts, and simultaneously bring the lethality of the tank’s weapons systems to action. Target acquisition, extended ranges out to two kilometers, first round hits, and operating as a crew were the significant challenges. The gunnery range maneuver and engagement scenarios included a call for artillery fire support and a medivac evacuation for a crewmember. While half of the crews were busy demonstrating their gunnery and maneuver proficiency on the tank range, the other half demonstrated their knowledge and skills in a series of STXs. The tested tasks included preparing for combat operations, engaging opposing forces after occupying a hasty battle position, reacting to a simulated chemical, biological, radiological, nuclear, and explosives (CBRNE) attack, reacting to indirect fire, conducting an evacuation of a wounded crewman drill, breaking and reinstalling track on an M1 series tank, and performing preventive maintenance, checks and services. The competing crews were staggered by their points’ placement on the morning of the last day where each tank crew ran a 1.7-mile course to Brave Rifles Field. On the field and in the presence of hundreds of cheering fans, each crew member performed several tank-related mental and physical tasks. In the end, all crews finished, and all were victorious at demonstrating the desire to win and the heart and courage of the American soldier, marine, or Australian or Kuwaiti military service member. Brig. Gen. David A. Lesperance, commandant of the U.S. Army Armor School at the Maneuver Center of Excellence, spoke at the competition’s closing ceremony and recognized the top three tank crews. Finishing in second place was the crew (Devil 24) from C Company 1st Battalion, 16th Infantry Regiment, 1st ABCT, 1st Infantry Division. Finishing in third place was the crew from the 2d Tank Battalion, 2nd Marine Division. Next year the Armor School at Fort Benning, Ga., will host the Gainey Cup competition to recognize the world’s best scout squads. These professional development events are occurring every day all around the Army and across the nation. If you are interested in any of the discussions in this article, in this publication, or in social media on our webpage, then you need to be part of the team and a member of the Army’s professional association. There is no substitute for the knowledge and wisdom gained through experience, and when you are a young up-and-coming Army professional, associating with other members of your profession with varied experiences creates a unique opportunity to learn through the eyes of others.